Author: Marijn van Putten. Series edited by: Harry Stroomer. 16 pp. Roman, 340 pp. The Awjila language is a highly endangered Berber language spoken in oasis town Awjila in the Cyrenaica region of northeastern Libya. It has several features that make the language different from other Berber languages, such as a phonemic accent, schwa in open syllables and the retention of the Proto-Berber *β as v.
This book consists of three parts: the grammar, the texts and the lexicon. 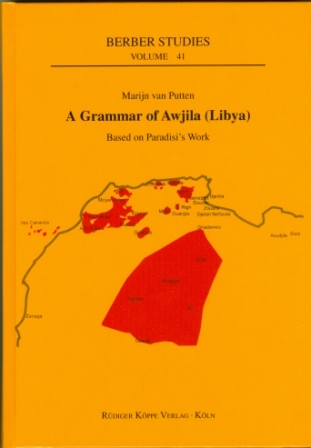 The grammar is the main analytical part, but could not exist without the in-depth study of the available Awjila texts and the lexicon. Due to the political situation in Libya, it was not possible to conduct fieldwork on the language. This presentation is therefore based on the published sources on the language. The texts and a word list by Umberto Paradisi are the most important of these sources. The grammar contains a comprehensive discussion on the interpretation and analysis of the transcription and phonology. This part gives us many new insights into the interpretation of many factors of the language. Besides the phonology, the grammar also discusses the morphology of the noun and verb, and the syntax of the language. In the appendix of the edition all published Awjila texts have been included, provided with a phonemic transcription and a word-by-word analysis. This analysis is essential for the understanding of the language, and it is referenced extensively in the grammar. The lexicon contains all lexical material available to us on the Awjila language, with a new phonemic analysis of the transcriptions, and a full concordance of all the attestations of the words in its different grammatical forms in the available sources. The lexicon also contains some etymological notes, comparing Awjila to the other Berber languages which will aid future research into the linguistic history of Awjila and other Berber languages. Insgesamt ist es [das Werk] sorgfältig recherchiert und macht eine bislang wenig bekannte Berbersprache in einer klaren Darstellung zugänglich. Das Buch versammelt alles bisherige Wissen über die Sprache so vollständig, dass man bequem mit ihm arbeiten kann, ohne weitere Literatur bei der Hand haben zu müssen. [...] Man darf hoffen, dass verbliebene Unklarheiten durch Kontakt mit Sprechern aus Awjila künftig noch beseitigt werden können, vielleicht durch van Putten persönlich.